After being away a few weekends in a row, I’m enjoying spending this weekend at home, particularly in my garden. After having recently re-potted some plants, I have been tending to them in the hope that they’re all happy in their new homes. 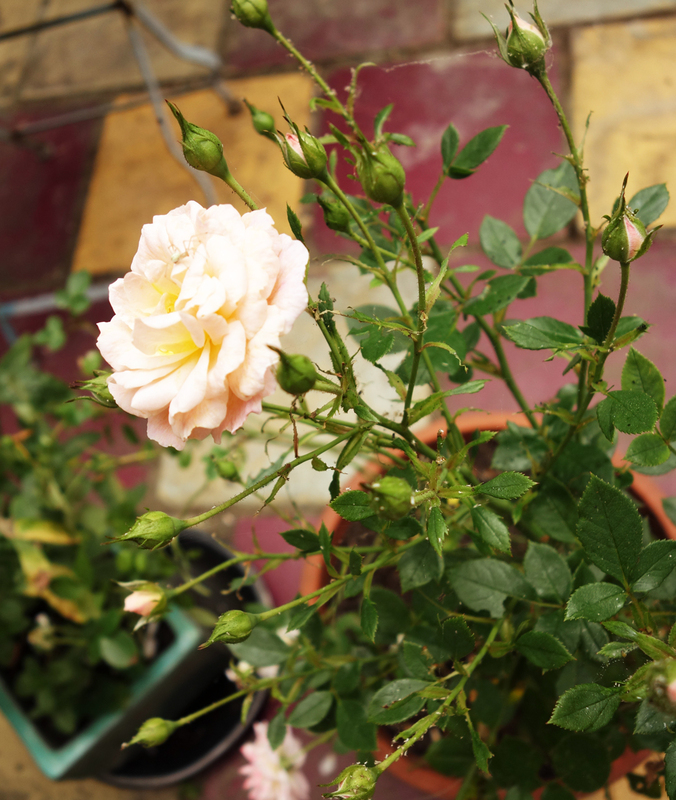 I’m pleased that two of the roses I replanted are doing well and one even has some flowers. One of things that I love about summer is the sight and smell of roses everywhere. 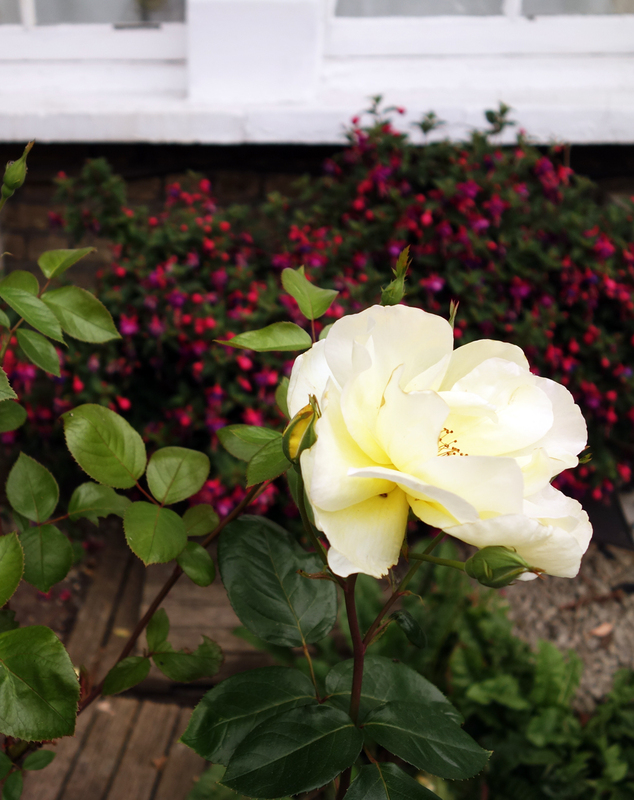 Even in small city gardens, they pop up…pink, white, yellow, red, orange. Apparently each variety, of which there are several hundred, has its own fragrance that changes as the plant ages. I can see why the rose has been one of the favourite subjects of English china makers’ designs. Not only are they visually beautiful but their long history all over the world gives them an added symbolic nature. They have been used in celebrations for many centuries, as medicine and perfume, and even as an important symbol for the two sides in the Wars of the Roses. 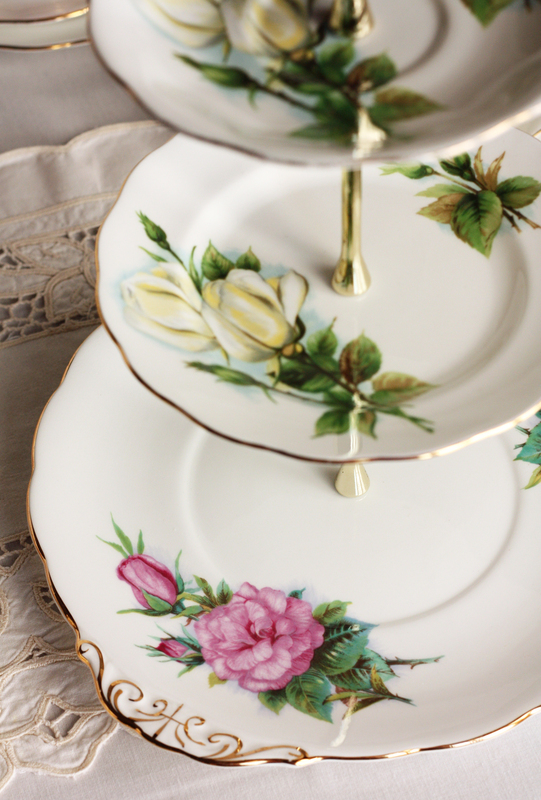 Probably the most popular and widely known rose pattern on English china is Royal Albert’s Old Country Roses, which I wrote about in a previous post, along with its lesser known Old English Rose, which is one of my favourite patterns. Roses are used in a number of different ways on china patterns. Like the Royal Albert patterns above, many have large pictures of roses as the main subject. In the 1960s Royal Standard and Paragon (amongst others) created tea sets from the Harry Wheatcroft famous roses collection. Wheatcroft was a famous grower of English roses and during the early twentieth century introduced a large variety of roses to Britain. 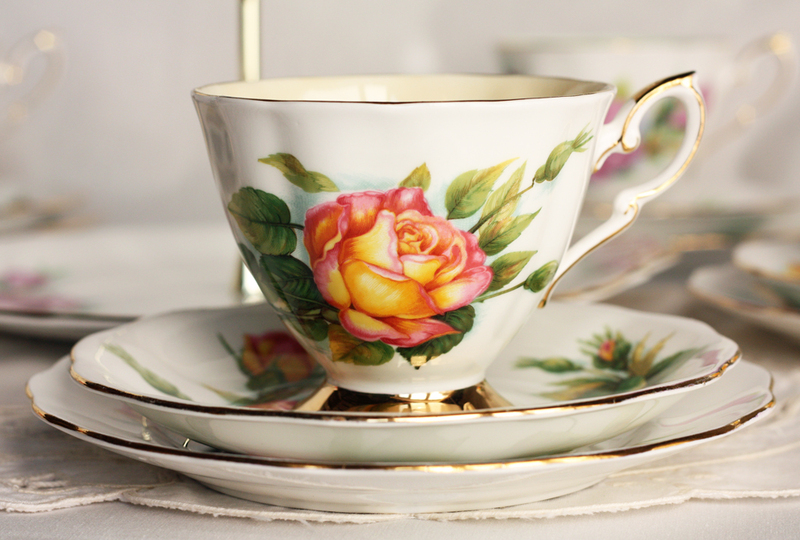 I like that each tea set from this Royal Standard range has the name of the rose underneath. The rose on this set is called Rendezvous. This one is a Peace rose. The inside of the cups match the hues of the roses. I made a cake stand to match the tea sets. I don’t know what the white rose is but the pink one is Prelude. 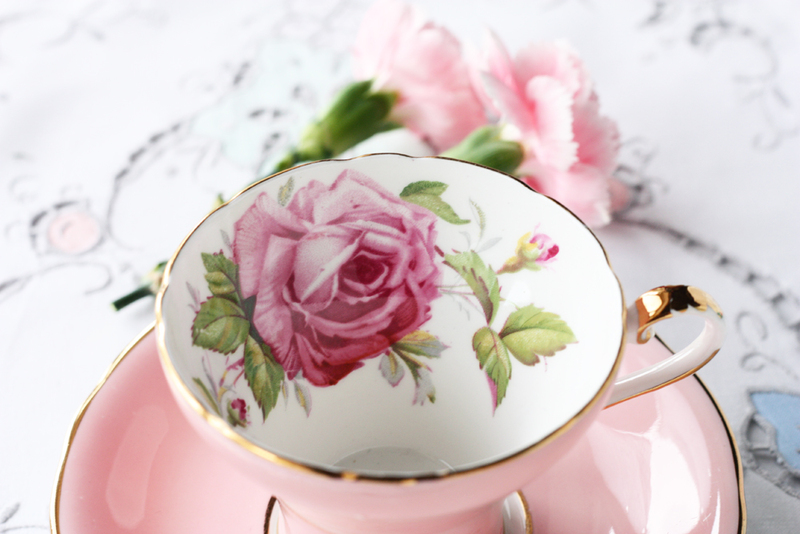 An unusual take on rose patterns is to cover the entire inside of the cup with roses. 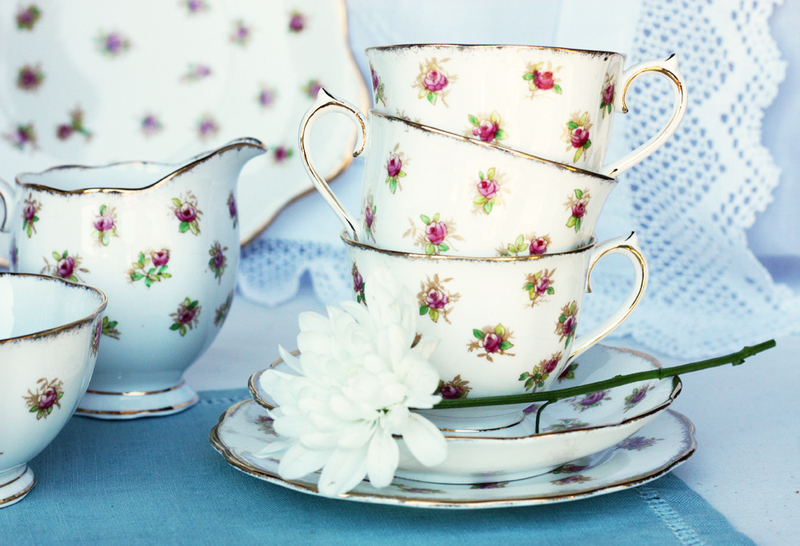 Aynsley executed this beautifully on their tea cup and saucer sets, which were introduced in the 1930s. 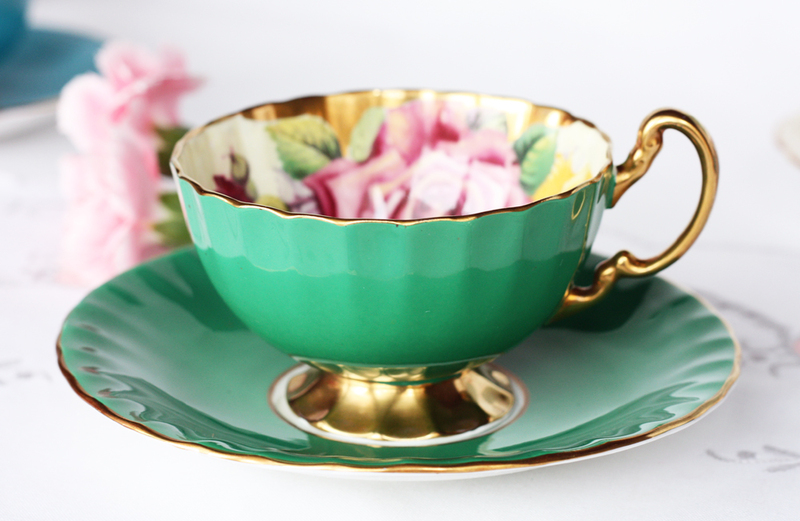 The colourful collection of roses is contrasted perfectly with the simple monotone shell of the cup and saucer, with a splash of gold on the handles and cup pedestal. 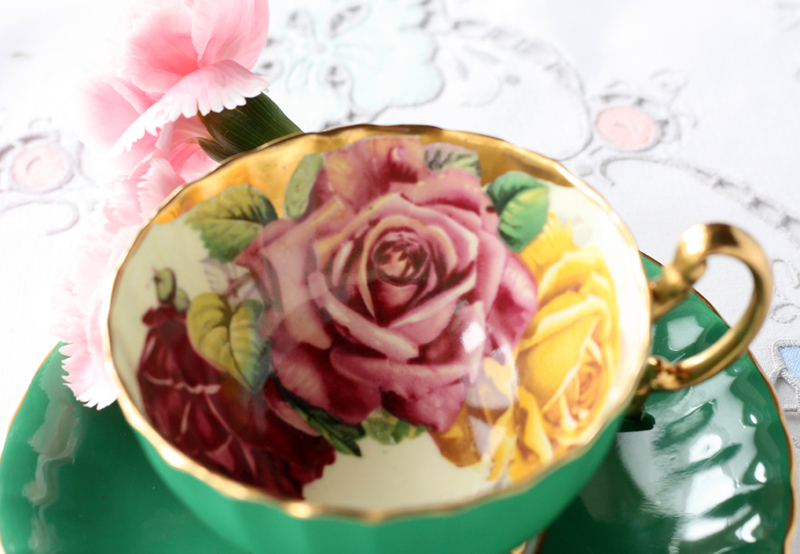 The pink, crimson and yellow of the roses in this tea cup are perfectly at home with the lush green garden of the outside of the cup and saucer. The pink version has a softer dreamier feel to it. 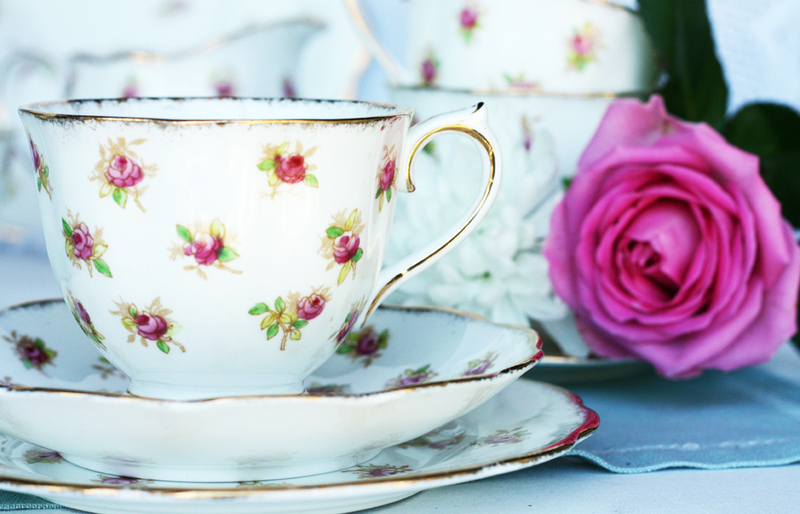 For those who prefer a more subtle reference to roses, tea sets that use small rose motifs as recurring patterns on china offer an alternative to the bold rose patterns above. 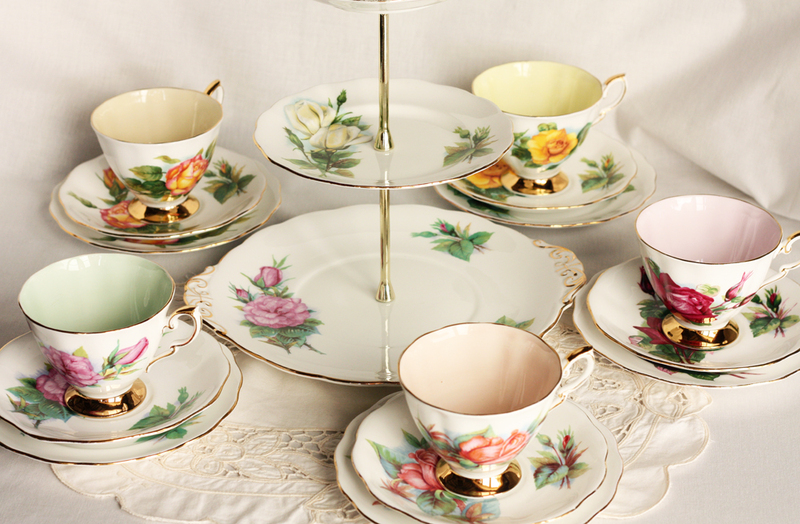 Numerous china makers produced rosebuds designs, Duchess, Paragon, even Royal Albert. 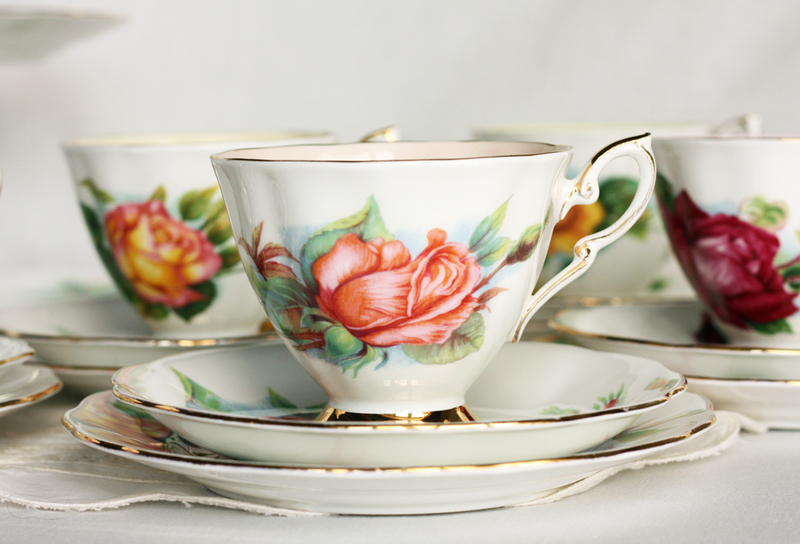 Here are some Royal Albert sets from the 1930s, where the tiny roses have a sketch-like quality to them. The design reminds me of an artist’s sketchpad each rose being a small flower study in watercolour reflecting subtle differences between roses on the same plant. 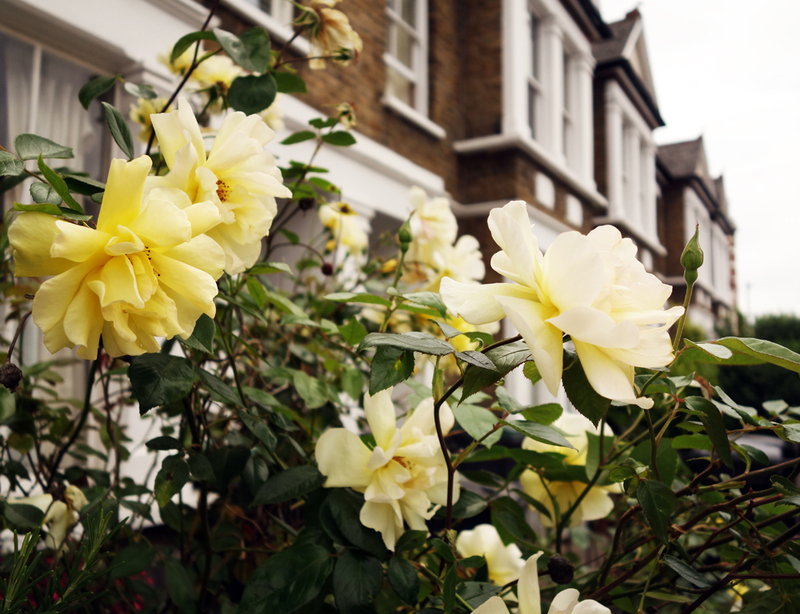 I’ll leave you with a couple of pictures of some creamy yellow roses from my garden, which to me, are a quintessential feature of a summer garden! Thanks Sharon! I’ve been looking at the photos of your teacup candles. They’re lovely, you have some really beautiful pieces. 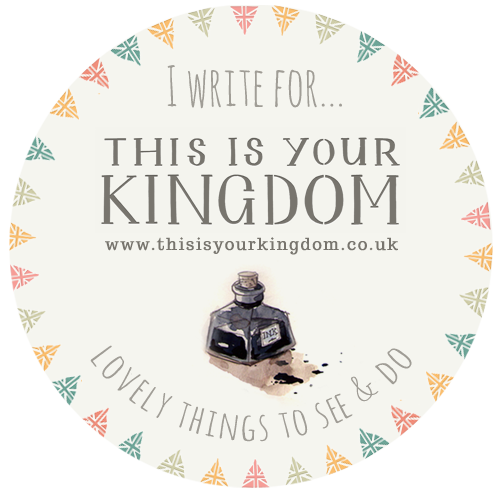 I spotted a gorgeous creamy fluted cup – maybe a Shelley? Hope you’ve been having fun doing craft fairs! 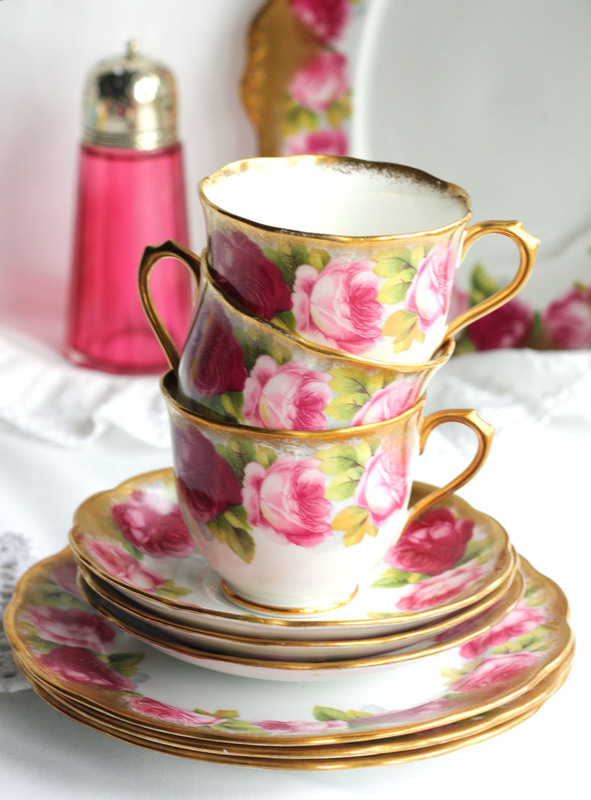 I am interested in more information about the Aynsely tea sets- I would love to locate some for myself! They are so beautiful!